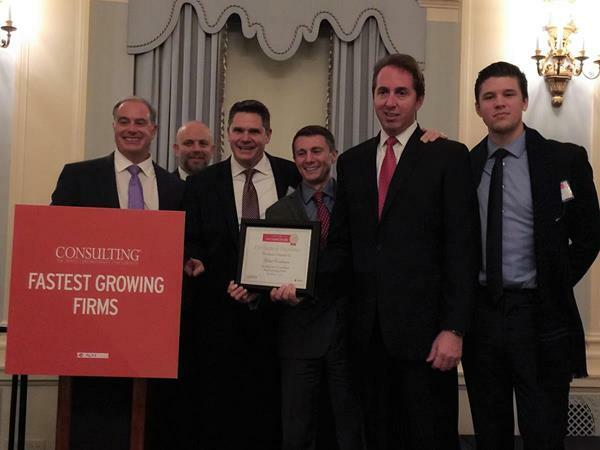 NEW YORK, Nov. 14, 2017 (GLOBE NEWSWIRE) — Global Conductor Management Consulting advanced 25 spots to be named the 25th “Fastest Growing Firm” by Consulting magazine during an awards ceremony at the Yale Club in New York City. Global Conductor attributes their success to the amazing teams they have been able to assemble for their clients as well as their approach to Listen to their clients, Connect with their needs, and Orchestrate solutions. This marks Global Conductor’s second consecutive year on the prestigious list, with another three-year period of remarkable growth from 2013 to 2016. Global Conductor has serviced over 40 Fortune 500 companies across 9 industries and 15 countries since 2002. Consulting magazine’s “Fastest Growing Firms” is a global list of the fastest growing consulting firms – designed to shine a light on those firms that are making a big impact with measurable results. Rankings are determined by evaluating revenue over the last three years. In a crowded market, competing with some of the most successful firms in the world, these firms are considered the future of the consulting industry. Global Conductor forecasts continued growth in 2018, especially within their automotive and healthcare practices. The central region has been a key growth prospect for Global Conductor with the recently established office in Plano, Texas along with their consistent growth in the consumer and industrial products, financial services, and government industry sectors. Global Conductor is a privately-held management consulting firm founded in 2002, providing business strategy, program and portfolio management, and ERP integration services to Fortune 500 and Global 1000 companies. Global Conductor is built on a foundation of core values and a Big-5 consulting background that strives to achieve excellence for our clients. Our dedicated approach to Listen, Connect, and Orchestrate allows us to provide unique solutions to match the needs and challenges of our clients.